The main entrance to Merton college is in Merton Street. The college is open 24h/24h, but if you plan to arrive after 22h, please phone the front desk at 01865 276310 to ensure that it is attended at the time of your arrival. A direct door to the TS Eliot lecture theatre from Rose Lane will be open during conference hours. Accommodation: Attendees are encouraged to stay onsite in Merton College, where Bed & Breakfast accommodation is offered – this will give you an Oxford student experience, with breakfasts served in the historic College Hall. Twin room (ensuite facilities) – £100.80 / night for single occupancy, or £144.00 /night for double occupancy. The most flexible way to book your accommodation at Merton College is directly on Merton College’s website: http://www.merton.ox.ac.uk/conferences/bedrooms. 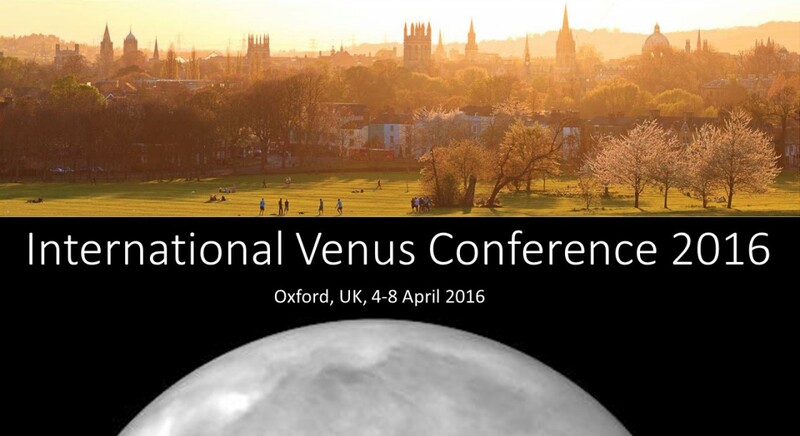 To make a booking for the Venus conference, use booking code IVSC2016. This will allow booking of rooms at any point between 2 and 10 April. If you are looking for a single room, arriving Sunday 3 April and leaving 8 April, you will be offered the opportunity to purchase this package at a 17% discount as part of the registration process. For all other enquiries (different arrival dates, double occupancy etc), please book via http://www.merton.ox.ac.uk as instructed above. – The Mercure Eastgate Hotel is less than 200 m from Merton College – www.mercure.com/Oxford-hotels. – Air: Oxford is very easy to reach from Heathrow and Gatwick airport; a fast and frequent bus service is available, details at http://airline.oxfordbus.co.uk/. Merton College is <200m from the “High Street” stop on this bus service. Birmingham or Southampton airports are also convenient, as these airports have a direct train service to Oxford. London’s Stansted and Luton airports are more cumbersome to get to; they can be reached by train via London, or by infrequent coaches. – Train: There are frequent services to Oxford from London Paddington station. Train information can be found at www.nationalrail.co.uk. – Bus: There are very frequent bus services between Oxford and London. The Oxford Tube runs up to 6 times per hour; the Oxford X90 runs up to 4 times per hour. If arriving in Oxford, get off at the “High Street” (or “Queens lane”) bus stop, this is very close to Merton College.